This phishing attempt, disguised as an official email from a (fictional) bank, attempts to trick the bank's members into giving away their account information by "confirming" it at the phisher's linked website. In computing, phishing is a criminal activity using social engineering techniques. Phishers attempt to fraudulently acquire sensitive information, such as usernames, passwords and credit card details, by masquerading as a trustworthy entity in an electronic communication. eBay and PayPal are two of the most targeted companies, and online banks are also common targets. Phishing is typically carried out by email or instant messaging, and often directs users to give details at a website, although phone contact has been used as well. Attempts to deal with the growing number of reported phishing incidents include legislation, user training, and technical measures. The first recorded mention of the term phishing is on the alt.online-service.america-online Usenet newsgroup on January 2, 1996, although the term may have appeared even earlier in the print edition of the hacker magazine 2600.A phishing technique was described in detail as early as 1987, in a paper and presentation delivered to the International HP Users Group, Interex. The term phishing is a variant of fishing, probably influenced by phreaking, and alludes to the use of increasingly sophisticated lures to "fish" for a user's financial information and passwords. The word may also be linked to leetspeak, in which ph is a common substitution for f. The popular theory that it is a portmanteau of password harvesting is an example of folk etymology. Those who would later phish on AOL during the 1990s originally used fake, algorithmically generated credit card numbers to create accounts on AOL, which could last weeks or even months. After AOL brought in measures in late 1995 to prevent this, early AOL crackers resorted to phishing for legitimate accounts. Phishing on AOL was closely associated with the warez community that exchanged pirated software. A phisher might pose as an AOL staff member and send an instant message to a potential victim, asking him to reveal his password. In order to lure the victim into giving up sensitive information the message might include text such as "verify your account" or "confirm billing information". Once the victim had submitted his password, the attacker could access and use the victim's account for criminal purposes, such as spamming. Both phishing and warezing on AOL generally required custom-written programs, such as AOHell. Phishing became so prevalent on AOL that they added a line on all instant messages stating: "no one working at AOL will ask for your password or billing information". After 1997, AOL's policy enforcement with respect to phishing and warez became stricter and forced pirated software off AOL servers. AOL simultaneously developed a system to promptly deactivate accounts involved in phishing, often before the victims could respond. The shutting down of the warez scene on AOL caused most phishers to leave the service, and many phishers — often young teens — grew out of the habit. Capture of AOL account information may have led phishers to misuse credit card information, which then evolved into attacks against online payment systems. The first known direct attempt against a payment system affected E-gold in June 2001, which was followed up by a "post-911 id check" shortly after the September 11 attacks on the World Trade Center. Both were viewed at the time as failures, but can now be seen as early experiments towards more fruitful attacks against mainstream banks. By 2004, phishing was recognized as fully industrialized, in the sense of an economy of crime: specializations emerged on a global scale and provided components for cash which were assembled into a finished attack. A chart showing the increase in phishing reports from October 2004 to June 2005. 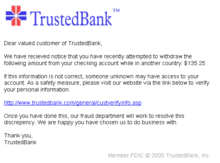 More recent phishing attempts have targeted the customers of banks and online payment services. E-mails supposedly from the Internal Revenue Service have also been used to glean sensitive data from U.S. taxpayers. While the first such examples were sent indiscriminately in the hope of finding a customer of a given bank or service, recent research has shown that phishers may in principle be able to establish what bank a potential victim has a relationship with, and then send an appropriate spoofed email to this victim. Targeted versions of phishing have been termed spear phishing. Social networking sites are also a target of phishing, since the personal details in such sites can be used in identity theft; in late 2006 a computer worm took over pages on MySpace and altered links to direct surfers to websites designed to steal login details. Experiments show a success rate of over 70% for phishing attacks on social networks. Most methods of phishing use some form of technical deception designed to make a link in an email (and the spoofed website it leads to) appear to belong to the spoofed organization. Misspelled URLs or the use of subdomains are common tricks used by phishers, such as this example URL, http://www.yourbank.com.example.com/. Another common trick is to make the anchor text for a link appear to be valid, when the link actually goes to the phishers' site. An old method of spoofing used links containing the '@' symbol, originally intended as a way to include a username and password (contrary to the standard). For example, the link http://www.google.com@members.tripod.com/ might deceive a casual observer into believing that it will open a page on www.google.com, whereas it actually directs the browser to a page on members.tripod.com, using a username of www.google.com: the page opens normally, regardless of the username supplied. Such URLs were disabled in Internet Explorer, while the Mozilla and Opera web browsers opted to present a warning message and give the option of continuing to the site or cancelling. A further problem with URLs has been found in the handling of Internationalized domain names (IDN) in web browsers, that might allow visually identical web addresses to lead to different, possibly malicious, websites. Despite the publicity surrounding the flaw, known as IDN spoofing or a homograph attack, no known phishing attacks have yet taken advantage of it. Phishers have taken advantage of a similar risk, using open URL redirectors on the websites of trusted organizations to disguise malicious URLs with a trusted domain. An attacker can even use flaws in a trusted website's own scripts against the victim. These types of attacks (known as cross-site scripting) are particularly problematic, because they direct the user to sign in at their bank or service's own web page, where everything from the web address to the security certificates appears correct. In reality, the link to the website is crafted to carry out the attack, although it is very difficult to spot without specialist knowledge. Just such a flaw was used in 2006 against PayPal. A Universal Man-in-the-middle Phishing Kit, discovered by RSA Security, provides a simple-to-use interface that allows a phisher to convincingly reproduce websites and capture log-in details entered at the fake site. Not all phishing attacks require a fake website. Messages that claimed to be from a bank told users to dial a phone number regarding problems with their bank accounts. Once the phone number (owned by the phisher, and provided by a Voice over IP service) was dialed, prompts told users to enter their account numbers and PIN. Voice phishing sometimes uses fake caller-ID data to give the appearance that calls come from a trusted organization. PayPal phishing example In an example PayPal phish (right), spelling mistakes in the email and the presence of an IP address in the link (visible in the tooltip under the yellow box) are both clues that this is a phishing attempt. Another giveaway is the lack of a personal greeting, although the presence of personal details is not a guarantee of legitimacy. In this second example, targeted at SouthTrust Bank users, the phisher used an image to make it harder for anti-phishing filters to detect text commonly used in phishing emails. The damage caused by phishing ranges from loss of access to email to substantial financial loss. This style of identity theft is becoming more popular, because of the ease with which unsuspecting people often divulge personal information to phishers, including credit card numbers, social security numbers, and mothers' maiden names. There are also fears that identity thieves can add such information to the knowledge they gain simply by accessing public records. Once this information is acquired, the phishers may use a person's details to create fake accounts in a victim's name, ruin a victim's credit, or even prevent victims from accessing their own accounts. It is estimated that between May 2004 and May 2005, approximately 1.2 million computer users in the United States suffered losses caused by phishing, totaling approximately US$929 million. U.S. businesses lose an estimated US$2 billion per year as their clients become victims. In the United Kingdom losses from web banking fraud — mostly from phishing — almost doubled to £23.2m in 2005, from £12.2m in 2004, while 1 in 20 users claimed to have lost out to phishing in 2005. The UK banking body APACS' stance is that "customers must also take sensible precautions...so that they are not vulnerable to the criminal." Similarly, when the first spate of phishing attacks hit the Irish Republic's banking sector in September 2006, the Bank of Ireland initially refused to (and still insists that its policy is not to) cover losses suffered by its customers, although losses to the tune of €11300 were made good. There are several different techniques to combat phishing, including legislation and technology created specifically to protect against phishing. One strategy for combating phishing is to train users to deal with phishing attempts. User education can be promising, especially where training provides direct feedback to the user on his success (or otherwise). One newer phishing tactic, which uses phishing emails targeted at a specific company, known as spear phishing, has been harnessed to train users at various locations, including West Point Military Academy. In a June 2004 experiment with spear phishing, 80% of 500 West Point cadets who were sent a fake email were tricked into revealing personal information. Users can take steps to avoid phishing attempts by slightly modifying their browsing habits. Users who are contacted about an account needing to be "verified" (or any other topic used by phishers) can contact the company that is the subject of the email to check that the email is legitimate, or can type in a trusted web address for the company's website into the address bar of their browser to bypass the link in the suspected phishing message. Nearly all legitimate email messages from companies to their customers will contain an item of information that is not readily available to phishers. Some companies, like PayPal, always address their customers by their username in emails, so if an email addresses a user in a generic fashion ("Dear PayPal customer") it is likely to be an attempt at phishing. Emails from banks and credit card companies will often include partial account numbers. However, recent research  has shown that typical users do not distinguish between the first few digits and the last few digits of an account number. This is a significant problem since the first few digits often are the same for all clients of one financial institution. One should always be suspicious if the message does not contain specific personal information. Phishing attempts in early 2006, however, used such highly personalized information, making it unsafe to rely on personal information alone as a sign that a message is legitimate. Furthermore, another recent study concluded in part that the presence of this information does not significantly affect the success rate of phishing attacks, suggesting that most users do not pay attention to such details anyway. The Anti-Phishing Working Group, an industry and law enforcement association, has suggested that conventional phishing techniques could become obsolete in the future as people are increasingly aware of the social engineering techniques used by phishers. They propose that pharming and other uses of malware will become more common tools for stealing information. Anti-phishing measures have been implemented as features embedded in browsers, as extensions or toolbars for browsers, and as part of website login procedures. The following are some of the main approaches to the problem. Since phishing is based on impersonation, preventing it depends on users having some reliable way to identify the sites they are dealing with. For example, some anti-phishing toolbars display the real domain name for the visited website. The petname extension for Firefox lets users type in their own labels for websites, so they can later recognize when they are back at the correct site. If the site is a suspect, then the software may either warn the user or block the site outright. Another popular approach to fighting phishing is to maintain a list of known phishing sites and to check websites against the list. Microsoft's IE7 browser, Mozilla Firefox 2.0, and Opera all contain this type of anti-phishing measure. Firefox 2 uses Google anti-phishing software. Opera 9.1 uses live blacklists from PhishTank and GeoTrust, as well as live whitelists from GeoTrust. Some implementations of this approach send the visited URLs to a central service to be checked, which has raised concerns about compromising the user's privacy. According to a report by Mozilla in late 2006, Firefox 2 was found to be more effective than Internet Explorer 7 at detecting fraudulent sites in a study by an independent software testing company . An approach introduced in mid-2006 involves switching to a special DNS service that filters out known phishing domains, which will work with any browser. This is similar in principle to using a hosts file to block web adverts. To mitigate the problem of phishing sites spoofing a victim site and embedding its images (such as logos) in a spoof site, several site owners have responded by altering the images to send a message to the visitor. If the images were not requested in the normal way by visiting the real page then a warning that the site is fraudulent can be substituted for the usual image, or the original image can be moved to a new filename and the original permanently replaced with a warning. Bank of America is one of several websites that ask users to select a personal image, and display this user-selected image with any forms that request a password. Users are instructed to only enter a password when they see the image they selected; if the correct image does not appear, they are expected to recognize that the site is not legitimate. However, a recent study suggests few users refrain from entering their password when images are absent. This feature (like other forms of two-factor authentication) is also susceptible to other attacks, such as those suffered by Scandinavian bank Nordea in late 2005, and Citibank in 2006. Security skins are a related technique that involves overlaying a user-selected image across the login form as a visual cue that the form is legitimate. However, unlike the website-based image schemes, this image is shared between the user and the browser, not between the user and the website. The scheme also relies on a mutual authentication protocol, which makes it less vulnerable to attacks that affect user-only authentication schemes. Spam filters can also help by reducing the number of phishing emails that users receive in their inboxes. Several companies offer banks and other entities likely to suffer from phishing scams 24/7 services to monitor, analyze and assist in shutting down phishing websites. Individuals can contribute by reporting phishing to both volunteer and industry groups, such as PhishTank. On January 26, 2004, the U.S. Federal Trade Commission filed the first lawsuit against a suspected phisher. The defendant, a Californian teenager, allegedly created and used a webpage designed to look like the America Online website, so that he could steal credit card information. Other countries have followed the lead of the U.S. by tracing and arresting phishers. A phishing kingpin, Valdir Paulo de Almeida, was arrested in Brazil for leading one of the largest phishing crime rings, which in 2 years stole between $18 and $37 million USD. UK authorities jailed two men in June 2005 for their role in a phishing scam, in a case connected to the U.S. Secret Service Operation Firewall, which targeted notorious "carder" websites. In 2006 eight people were arrested by Japanese police on suspicion of phishing fraud by creating bogus Yahoo Japan Web sites, netting themselves 100 million yen ($870 thousand USD). The arrests continued in 2006 with the FBI Operation Cardkeeper detaining a gang of sixteen in the U.S. and Europe. In the United States, Senator Patrick Leahy introduced the Anti-Phishing Act of 2005 on March 1, 2005. The federal anti-phishing bill proposes that criminals who create fake web sites and spam bogus emails in order to defraud consumers could receive a fine up to $250,000 and receive jail terms of up to five years. The UK strengthened the legal arsenal against phishing with the Fraud Act 2006, which introduces a general offence of fraud that can carry up to a ten year sentence, and prohibits writing or possessing phishing kits with intent to commit fraud. Companies have also joined the effort to crack down on phishing. On March 31, 2005, Microsoft filed 117 federal lawsuits in the U.S. District Court for the Western District of Washington. The lawsuits accuse "John Doe" defendants of using various methods to obtain passwords and confidential information. March 2005 also saw Microsoft partner with the Australian government to teach law enforcement officials how to combat various cyber crimes, including phishing. Microsoft announced a planned further 100 lawsuits outside the U.S. in March 2006, followed by the commencement, as of November 2006, of 129 lawsuits mixing criminal and civil actions. AOL reinforced its efforts against phishing in early 2006 with three lawsuits seeking a total of $18 million USD under the 2005 amendments to the Virginia Computer Crimes Act, and Earthlink has joined in by helping to identify six men subsequently charged with phishing fraud in Connecticut. In January 2007, Jeffrey Brett Goodin of California became the first defendant convicted by a jury under the provisions of the CAN-SPAM Act of 2003. He was found guilty of sending thousands of e-mails to America Online users, while posing as AOL's billing department, which prompted customers to send personal and credit card information. Facing a possible 101 years in prison for the CAN-SPAM violation and ten other counts including wire fraud, unauthorized use of credit cards, and misusing AOL's trademark, he was sentenced to serve 70 months. Goodin had been in custody since failing to appear for an earlier court hearing and began serving his prison term immediately. ↑ Skoudis, Ed (June 13, 2006). "Phone phishing: The role of VoIP in phishing attacks". searchSecurity. ↑ Mitchell, Anthony (July 12, 2005). "A Leet Primer". TechNewsWorld. ↑ Stutz, Michael (January 29, 1998). "AOL: A Cracker's Paradise?". Wired News. （原先內容喺2005年12月14號歸檔）. 喺2007年8月13號搵到. ↑ "GP4.3 - Growth and Fraud - Case #3 - Phishing". Financial Cryptography. Dec 30, 2005. ↑ "In 2005, Organized Crime Will Back Phishers". IT Management. Dec 23, 2004. （原先內容喺2011年1月31號歸檔）. 喺2007年8月13號搵到. ↑ "The economy of phishing: A survey of the operations of the phishing market". First Monday. Sep 2005. ↑ Evgeniy Gabrilovich and Alex Gontmakher (February 2002). "The Homograph Attack" (PDF). Communications of the ACM. 45(2): 128. ↑ Leyden, John (August 15, 2006). "Barclays scripting SNAFU exploited by phishers". The Register. ↑ "Phishing con hijacks browser bar". BBC News. April 8, 2004. ↑ Hoffman, Patrick (January 10, 2007). "RSA Catches Financial Phishing Kit". eWeek. ↑ Gonsalves, Antone (April 25, 2006). "Phishers Snare Victims With VoIP". Techweb. （原先內容喺2007年3月28號歸檔）. 喺2007年8月13號搵到. ↑ "Identity thieves take advantage of VoIP". Silicon.com. March 21, 2005. （原先內容喺2005年3月24號歸檔）. 喺2007年8月13號搵到. ↑ Krebs, Brian (November 18, 2004). "Phishing Schemes Scar Victims". washingtonpost.com. ↑ Kerstein, Paul (July 19, 2005). "How Can We Stop Phishing and Pharming Scams?". CSO. （原先內容喺2008年3月24號歸檔）. 喺2007年8月13號搵到. ↑ Richardson, Tim (May 3, 2005). "Brits fall prey to phishing". The Register. ↑ Bank, David (August 17, 2005). "'Spear Phishing' Tests Educate People About Online Scams". The Wall Street Journal. ↑ Zeltser, Lenny (March 17, 2006). "Phishing Messages May Include Highly-Personalized Information". The SANS Institute. ↑ Markus Jakobsson and Jacob Ratkiewicz. "Designing Ethical Phishing Experiments" (PDF). WWW '06. （原先內容 (PDF)喺2006年7月24號歸檔）. 喺2007年8月13號搵到. ↑ Kawamoto, Dawn (August 4, 2005). "Faced with a rise in so-called pharming and crimeware attacks, the Anti-Phishing Working Group will expand its charter to include these emerging threats.". ZDNet India. （原先內容喺2005年11月30號歸檔）. 喺2007年8月13號搵到. ↑ Krebs, Brian (August 31, 2006). "Using Images to Fight Phishing". Security Fix. ↑ Seltzer, Larry (August 2, 2004). "Spotting Phish and Phighting Back". eWeek. ↑ Brubaker, Bill (July 14, 2005). "Bank of America Personalizes Cyber-Security". Washington Post. ↑ "Phishers target Nordea's one-time password system". Finextra. October 12, 2005. ↑ Krebs, Brian (July 10, 2006). "Citibank Phish Spoofs 2-Factor Authentication". Security Fix. ↑ McMillan, Robert (March 28, 2006). "New sites let users find and report phishing". LinuxWorld. （原先內容喺2009年1月19號歸檔）. 喺2007年8月13號搵到. ↑ Legon, Jeordan (January 26, 2004). "'Phishing' scams reel in your identity". CNN. ↑ Leyden, John (March 21, 2005). "Brazilian cops net 'phishing kingpin'". The Register. ↑ Roberts, Paul (June 27, 2005). "UK Phishers Caught, Packed Away". eWEEK. ↑ "8 held over suspected phishing fraud". The Daily Yomiuri. May 31, 2006. ↑ "Phishers Would Face 5 Years Under New Bill". Information Week. March 2, 2005. ↑ "Prison terms for phishing fraudsters". The Register. November 14, 2006. ↑ Espiner, Tom (March 20, 2006). "Microsoft launches legal assault on phishers". ZDNet. ↑ Leyden, John (November 23, 2006). "MS reels in a few stray phish". The Register. ↑ Brulliard, Karin (April 10, 2005). "Va. Lawmakers Aim to Hook Cyberscammers". Washington Post. SecurityFocus - forensic examination of a phishing attack.